The modern design and unique architecture of Rixos The Palm Dubai shows two connected buildings seeming like one due to the connecting atrium lobby. The Hotel features 231 spacious and comfortable rooms and suites, 28 Residential Suites with different views of the Arabian Gulf and Dubai Skyline from various heights and directions. 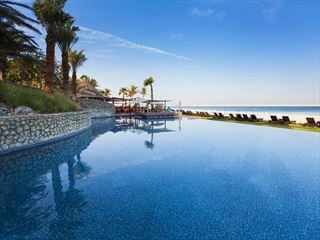 Rixos The Palm offered contemporary and spacious bedrooms for the comfort and privacy of families. Rixos The Palm Dubai’s 259 Five Star guest rooms, including 28 luxurious residential suites, are very spacious and glow with a warm welcoming to all. 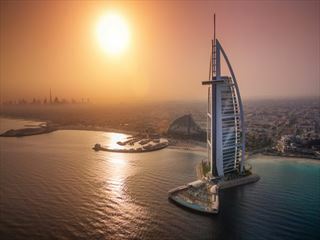 Most of the luxury guest rooms offer spectacular views of the Gulf Sea and Dubai Skyline from your private balconies, with Sun Beds, generously sized marbled bathrooms including a deep soaking bath tub. 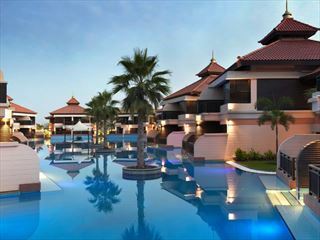 All these are combined together with a wealth of deluxe amenities everywhere in the resort. Details reflect a passion for perfection that sets Rixos apart. Nar Beach - Featuring an entertainment programme like no other, Nar Beach is a popular spot where you will witness a diversity of events, from classical recitals, to concerts and big screen movie viewing. Suites Beach offers the kind of privacy we all yearn for. Spend the whole day with your friends and family in an intimate atmosphere inside one of our luxurious cabanas. Family Beach - Make unforgettable memories on this stunning beach. Dedicated exclusively to families who are looking for a respite from the hustle and bustle of everyday life, where they may spend some time with their loved ones and find some peace in a calm and welcoming environment. A La Turca, located on the ground floor, serves a great variety of delicacies, reflecting the essence of Turkish Cuisine. An international breakfast is offered, complimented with authentic Turkish breakfast savouries. The lunch and dinner buffets include a wide range of genuine Turkish dishes from the Aegean, Eastern Anatolia and the Black Sea featuring Turkish grills, kebabs, mezzes and other home-made culinary treats. Additionally, an international à la carte menu is offered for lunch and dinner. Shaded decorated outdoor terrace of A la Turca you can find all types of traditional specialities. Chef’s – Steak House, the hotel’s speciality restaurant takes you on a gastronomic journey with a magnificent view of the Palm Island combining modern European cuisine with the Australian, Argentinean and traditional Turkish meat infused with modern flavours, accented with high quality fresh ingredients, simply prepared and elegantly presented, in a chic yet relaxed ambience. A weekly calendar of entertainment programme adds dimension and energy to the place with live Jazz Band. ROCCHA - Mediterranean Restaurant, where you will find some of the most sumptuous dishes from the Mediterranean region, all in a convenient and relaxed, friendly setting on the Palm Island. Whether it’s mouth watering seafood and a scrumptious Mediterranean dishes you are after or a fabulous setting to celebrate a special occasion, you’ll feel completely treated and satisfied at Roccha Mediterranean Restaurant.